Advanced laser applications in automotive manufacturing, critical updates in additive manufacturing, 3D printing, prototyping and the foremost economic and safety concerns for today’s laser professionals were just some of the topics center stage at LIA’s fifth Lasers for Manufacturing Event® (LME®) and Summit, held from April 25-27, 2016 at the Renaissance® Atlanta Waverly Hotel and the adjacent Cobb Galleria Centre in Atlanta, GA. This year’s LME attendees were provided with more free educational opportunities than ever before, including key insight to benefit laser professionals of all skill levels and varied specializations. Continuing the annual tradition of equipping event attendees with the most essential “101” courses on every topic from laser manufacturing properties and applications to laser safety, LME also granted visitors the opportunity to sit in on their choice of intermediate, “102” courses, which discussed important and emerging topics such as laser welding, micro-machining, beam delivery and state-of-the-art laser marking. LIA also provided exclusive tutorials, including Process Monitoring: Seeing the Unseeable by Paul Webster of Laser Depth Dynamics, and an informative class on Laser Additive Manufacturing by Alabama Laser’s Wayne Penn. Once again, the Laser Technology Showcase proved to be the main highlight for 2016 LME attendees. Side by side with the educational courses at the event were four keynote presentations, including the kickoff Industrial Laser Market Overview, by Editor-in-Chief of Industrial Laser Solutions and LIA Past President David Belforte, and three additional speeches, Laser Applications in Automotive Manufacturing by Ralf Kimmel of TRUMPF Laser-und Systemtechnik GmbH, and Laser Technology, Metal Additive Manufacturing by EWI’s Shawn Kelly and Industrial Applications of Laser Materials Processing in GE by Marshall Jones of GE Global Research. The engaging set of 30-minute keynote addresses shared the advantages of utilizing laser technology with attendees. “It was a great show to get a snapshot of the current laser technology market all in one place,” said Charles Studiner, Process Development Engineer at 3M. Participants who needed a quick answer about what types of lasers would be the best fit for a particular application, or what components were needed to build the most efficient production system, received answers at the perennial favorite “Ask the Experts” booth. Chaired by Neil Ball of Directed Light Inc., and joined by a rotating cast of industry experts, the booth included insight from the top laser markers and system integrators in the business. Attendees were also able to find solutions to their current manufacturing needs in a wealth of industries, such as Optics, Automotive, Medical, Electronics and Energy – and chat with everyone from company owners to product managers to manufacturing engineers. 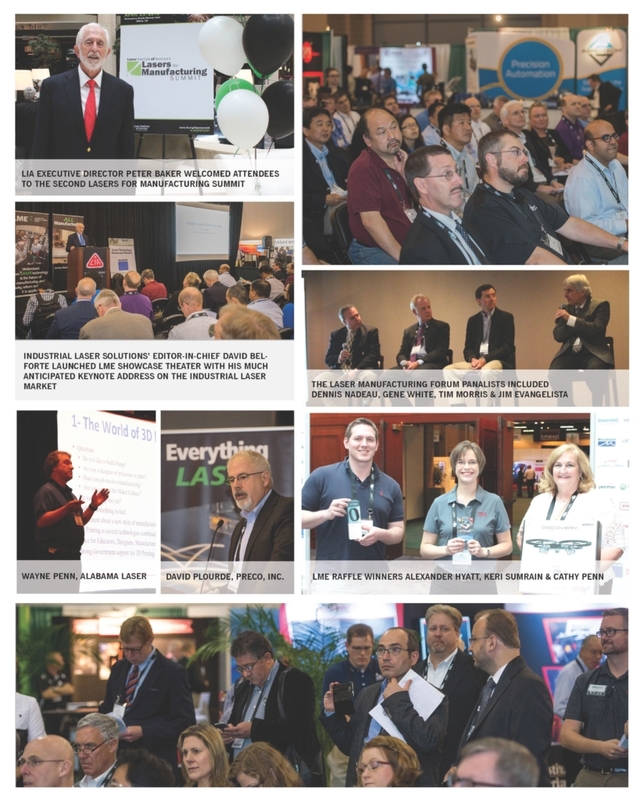 This continued LIA’s five-year tradition of spotlighting the latest developments in laser technology and providing the best place to work with the industry’s elite. The event as a whole began on April 25 at the Lasers for Manufacturing Summit, back for its second year – by popular demand – to provide laser executives and the C-suite with a chance to touch on global opportunities for laser processes, provide vital statistics on both established and emerging markets, and to engage a spirited panel discussion and question and answer period to provide the kind of insider perspective attendees can’t find anywhere else. Top executives heard first-hand, expert intelligence on how to use these powerful tools most profitably in a variety of high-value manufacturing applications. The Summit is particularly popular for executives, because it is the only event that focuses on the entire lasers in manufacturing marketplace in one afternoon. This year, it provided a comprehensive market perspective unobtainable elsewhere, with data segmented by applications and laser technology from the laser industry’s leading resources. In addition, industry experts presented their views and analysis of laser-market trends, applications development and a business outlook. David Belforte began the Summit program with a keynote presentation that offered important insights into the global laser and laser additive manufacturing market, as well as a look into the state of the additive manufacturing industry as a whole. Five additional presentations covered pivotal applications used in the industry, including evolutions and applications of engineered welded blanks, laser materials processing, and its new tools, laser welding, laser cleaning, laser removal and the Laser Seam Stepper, a new fiber laser welding tool. Toward the Summit’s conclusion, panelists engaged in a Laser Manufacturing Forum, also moderated by Mr. Belforte. The participants included Jim Evangelista from Shiloh Industries, Tim Morris of Blackbird Robotics, Inc., Dennis Nadeau of Wayne Trail, and Gene White of Laser Flex. To conclude the packed event, a VIP Reception was held from 5-6:30 PM to allow attendees to meet with high-level executives, speakers and LIA board members in an intimate setting. Following the Summit from April 26-27, the two-day Lasers for Manufacturing Event at the Cobb Galleria Centre housed dozens of exhibitors, like American Photonics, HAAS Laser Technologies Inc., Pantron Automation Inc., Lumentum and Prima Power. Manufacturing professionals also benefited from the presence and guidance of media, cooperating societies and industry partners like Georgia Manufacturing Alliance, Industrial Laser Solutions and Prototype Today. The guidance offered at the Summit, in the LME technology showcase, during the educational sessions, and on the exhibit floor allowed attendees to not only obtain crucial information on incorporating lasers into their production, but critical assistance in getting started with instant access to top suppliers. “This year’s event was an excellent summary of laser machining companies and technology,” said Jefferson Odhner, President of Odhner Holographics. One of LME’s newest 2016 offerings was the Laser Technology Tour – an intelligible way for first-year attendees to explore the massive event. Tour attendees were able to take advantage of the personal guidance of seasoned event experts, who walked them through the exhibit floor and introduced them to different companies, all while discussing the latest technology and products showcased. 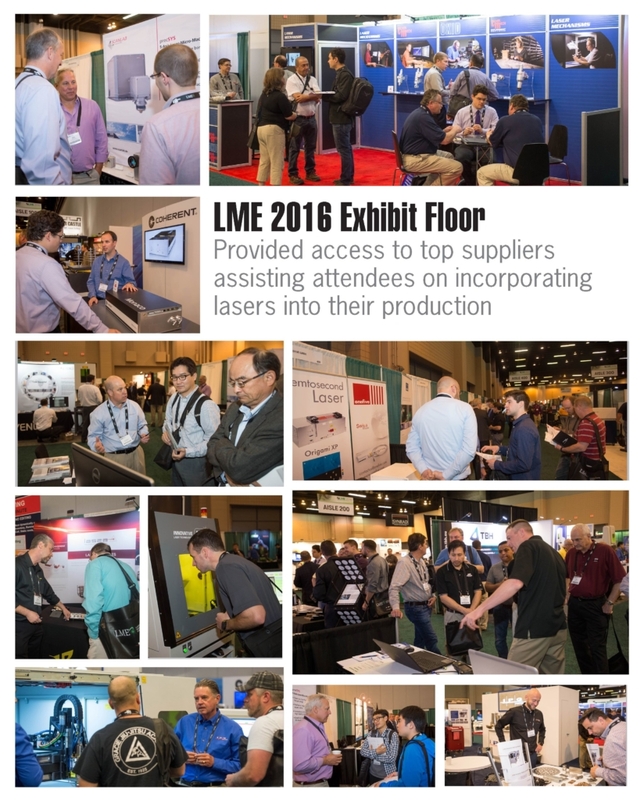 LME’s 2016 installation was exciting, inspiring and informative – and the next LME and Lasers for Manufacturing Summit will continue to be the foremost gathering place for the latest developments and insights for lasers in the manufacturing industry. Follow updates for the upcoming LME and Lasers for Manufacturing Summit at www.laserevent.org.